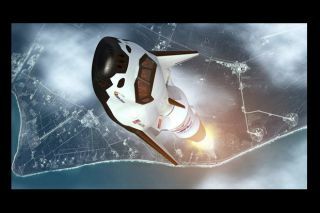 This illustration shows the Dream Chaser vehicle launching into space. A protoype of a space plane being developed to fly astronauts to and from the International Space Station will take to the skies again later this year. The prototype of Sierra Nevada Corp.'s Dream Chaser vehicle has already been through some drop tests and a free flight in 2013, which ended when the Dream Chaser skidded off the runway. The new series of flights will include several automated ones, followed by piloted trips, said Mark Sirangelo, corporate vice president of SNC’s space systems division. Three companies – Sierra Nevada, SpaceX and Boeing – are funded through the Commercial Crew Program right now, but that pool of competitors could get smaller in the next phase of the program, which will be announced later this year. "We believe we're well positioned for that next phase, but in addition to that, I think what we're doing is building a system [to attract] multiple clients," Sirangelo told reporters during a news conference today (June 12). Sierra Nevada aims to launch Dream Chaser into space for the first time in November 2016, company representatives have said. Sirangelo delivered his comments while announcing a contract with Craig Technologies, an engineering and technical company that is leasing a 161,000-square-foot building in Cape Canaveral, Florida, which was formerly used for NASA shuttle logistics. Craig will provide a piece of hardware that will help "move the Dream Chaser around and put it on its adapter for flight," Sirangelo said. Called a "cradle," the ground equipment device is intended to lift and move the spacecraft while it is being processed. "This is the first of many different pieces of business we will be doing here," Sirangelo said. Dream Chaser will ride to orbit aboard a United Launch Alliance Atlas 5 rocket and return to Earth by making a landing on a runway, much like NASA's space shuttles did before their retirement in 2011. Craig is expected to provide several other products and services to SNC, which Sirangelo said are being negotiated. The value of the contract was not disclosed. Dream Chaser space plane built by Sierra Nevada Corp. landed with its left landing gear undeployed in this still from an Oct. 26, 2013, unmanned drop test at Edwards Air Force Base in California. The malfunction caused the prototype to skid off the runway. In 2012, Craig also brokered a five-year Space Act Agreement with NASA for the agency to let it use 1,600 pieces of equipment that were once used to maintain and repair the shuttle. Because the agreement required Craig to stay within 50 miles (80 kilometers) of the Kennedy Space Center, Craig signed a lease with Cape Canaveral Ventures for the nearby shuttle depot. Since 2013, Craig (which has about 400 employees in the United States) has hired 150 employees, with 65 of those former shuttle workers. It also spent $2 million renovating the facility and hiring workers so far. "The important message is we're able to bring jobs, and keep that knowledge base, and retain that experience and that skilled work force that was here before," Carol Craig, founder and CEO of Craig Technologies, said during the news conference. "That's what we hope to bring to Mark and his team." Craig joins a list of about 40 companies that are participating in the Dream Chaser program. Sierra Nevada also has participated in missions such as NASA's Curiosity Mars rover, where it provided some of the systems that helped the rover land in the last minute of its so-called "seven minutes of terror" touchdown in 2012.